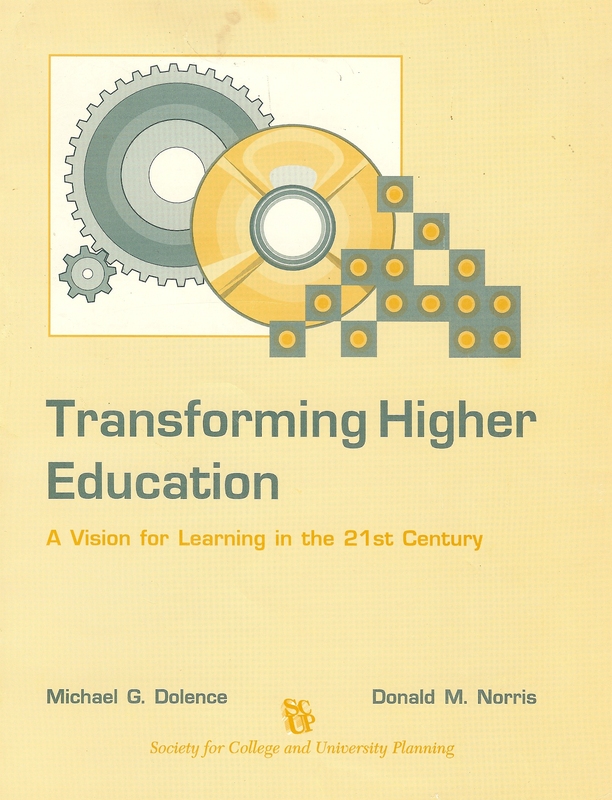 In Strategic Change in Colleges and Universities, the Rowley, Lujan, and Dolence show how the strategic planning process can lead to more constructive and effective change within the college and university environment. Solidly grounded in theory, this practical book builds on the authors’ experience of successfully implementing an original strategic planning approach on a variety of campuses in the United States and Canada. This powerful model works well in the wide range of higher educational settings, provides a consistent framework that unifies all levels involved, and is effective in keeping diverse groups of decision-makers focused on the most important elements of the organization’s success. The authors outline, step by step, a strategic planning process that is uniquely tailored to the needs of academic settings where multiple constituencies require a more collaborative planning approach than is used in corporations. 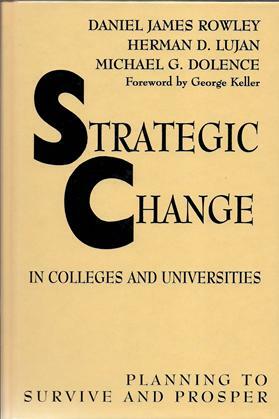 Strategic Change in Colleges and Universities is filled with illustrative examples that clearly show how the authors’ strategic planning principles, which they describe as a ?strategic planning engine,? work in practice. The book also discloses practical and realistic methods of navigating the political land mines that often obstruct the development of a strategic plan and its implementation. Offering clear directions on the many components of a successful implementation strategy, the authors show how to encourage communication, gain the backing of top leaders, and develop campuswide support. This collaborative model of strategic planning which (unlike other approaches used in academe) results in rather than starts from the institution’s mission statement. Each campus applies the same principles, developing its own method of planning to match its institution’s particular needs and characteristics. Strategic Change in Colleges and Universities is written for those charged with strategic planning–presidents, chancellors, vice presidents, Details a strategic planning approach that has proved effective in institutions across the country. The authors address the complex nature of stakeholders and conflicting purposes in an academic setting. Academics are under increasing pressure to develop a prototype for the future university that will keep pace with the increasing need for access to lifelong learning. 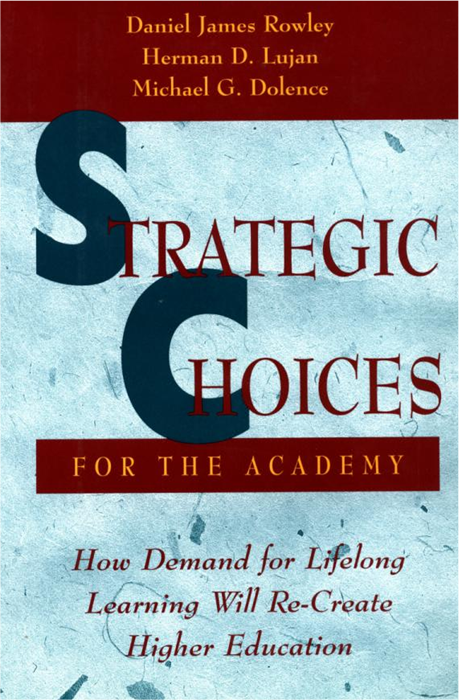 Strategic Choices for the Academy is filled with practical advice for developing strategic plans that will transform colleges and universities to meet the demands of today’s (and tomorrow’s) information age learner. Drawing on the strategic planning and management concepts presented in their companion books, Strategic Change in Colleges and Universities and Working Toward Strategic Change, the authors reveal which innovative organizational structures, facilities, teaching approaches, reward systems, and delivery systems are most effective for providing education to this new segment of learners? Those who come to learn in every stage of life and who may be increasingly reluctant to enroll in traditional campus settings. The book also presents a series of flexible models that can be adapted to the strategic direction and needs of individual institutions. Using the tools and information in Strategic Choices for the Academy, educators and administrators can serve the needs of today’s learners and survive and prosper into the future. This hands-on workbook develops the models presented and explained in Strategic Change in Colleges and Universities and gives participants the tools they need to develop, implement, and sustain a strategic plan that is both timely and vital. Offering a wealth of information in the form of guidelines, suggestions, and worksheets, this accessible workbook details the ten-step process from developing performance indicators through implementing, evaluating, and sustaining the strategic plan. 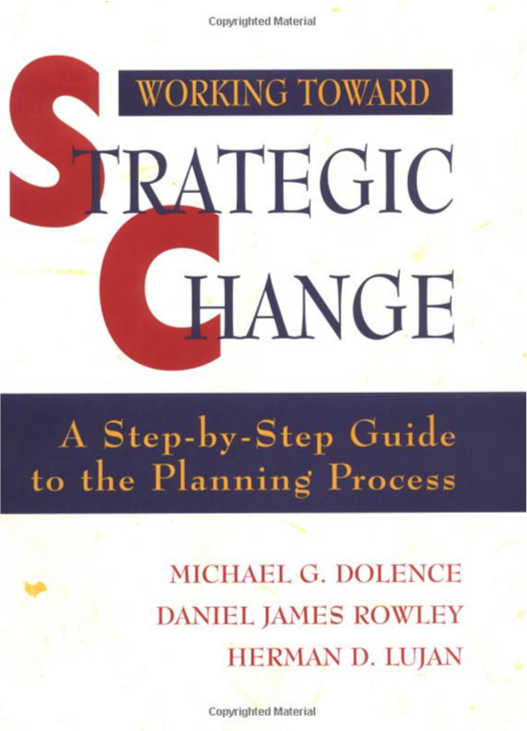 Each chapter of Working Toward Strategic Change highlights one of the ten strategic planning steps and contains both individual and group exercises and forms. The authors explain the central purpose of the step, discuss what results to expect, offer helpful suggestions for working with the materials, and include a set of reproducible forms or exercises that guide the process. These tested tools are designed to make the strategic planning activities more effective and streamlined. The practical material in the workbook can be applied to the wide spectrum of university and college settings, and the flexible exercises can easily integrate elements and practices that an institution may have already identified or implemented. Working Through Strategic Change is designed to help users work carefully and thoughtfully through the tasks of assembling, interpreting, and making decisions about critical information relating to the strategic planning process. In addition to its application in college and university settings, the book is also a valuable teaching aid and can be used to simulate a strategic planning exercise to give students a clear understanding of this complex process. 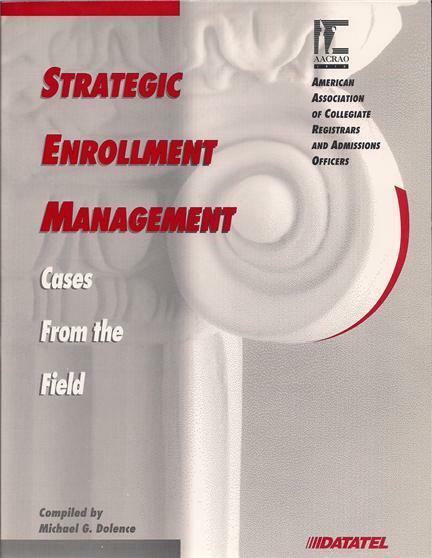 This booklet provides an overview of key concepts of Strategic Enrollment Management (SEM), a comprehensive process designed to help institutions of higher education achieve and maintain the optimum student recruitment, retention, and graduation rates. “Optimum” here is defined within the academic context of the particular institution. Primary goals of SEM are: stabilizing enrollments, linking academic programs and SEM, stabilizing finances, optimizing resources, improving services, improving quality, improving access to information, reducing vulnerability to environmental forces, and evaluating strategies and tactics. Underlying factors in linking an institution’s academic program and SEM are discussed including student choice, academic policies, balancing demand, serving students as clients, and optimizing teaching and learning. 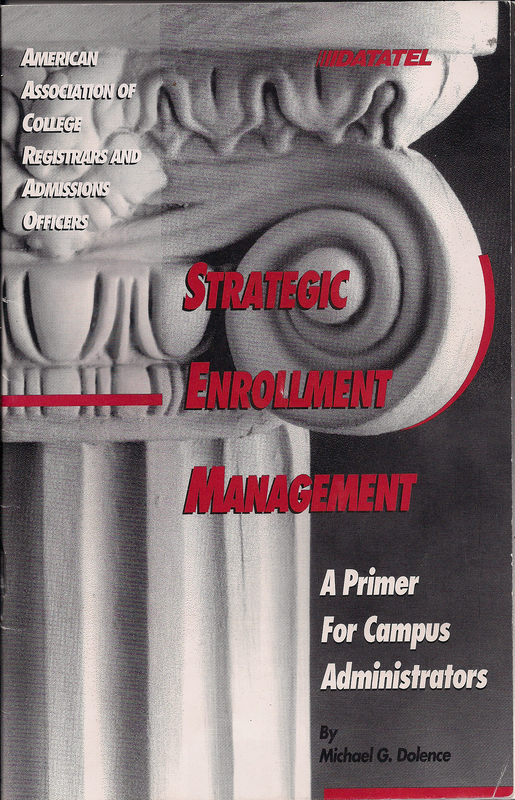 Following sections cover defining an institution’s optimum enrollment and the economics of SEM. A section on organizational options emphasizes the connection between successful SEM and active leadership from executive officers of an institution. Institutional strategies are described for recruitment, prospects and yields, marketing, retention, intervention, information, and reengineering. Critical success factors are discussed: leadership, strategic planning, comprehensiveness, performance indicators, research, academic foundation, information technology, and evaluation.